In the previous article I have explained Display records in Gridview according to DropDownSelection in Asp.net and Select, Edit, update and Delete in Gridview with storeprocedure using Linq. Splits a string into substrings that are based on the characters in an array. Like enter text with space, separated by ‘/’ or regular expressions etc. In this example I am going to split the text entered with space. Write the code on button click. 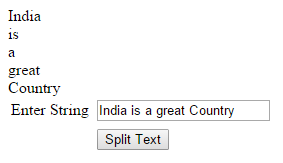 Dim pattern As [String] = "/"
If you like split the text after hyphen (-) replace the slash (/) sign in pattern. Spit the entered text in single letters. E.g. 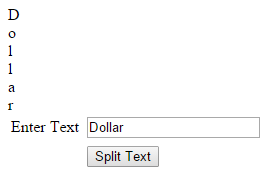 if I enter the Dollar in textbox, It splits into single letter D o l l a r.
In this article we have learn how to split the string in Asp.net (C#, VB). I hope you enjoyed this article.